A simple and lightweight contact module for Joomla! 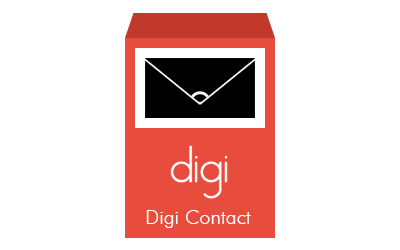 When you need a simple and lightweight contact module for Joomla, you can use Digi Contact, our Joomla contact form. This is a Joomla GDPR contact form. It offers the possibility to include an editable checkbox that the user must accept before being able to send the message. The module includes the ability to customize the contact form, either by hiding the default fields, or by adding new custom fields, in order to create a custom Joomla contact form. Digi Contact is the fastest way to receive contacts from your Joomla website, a lightweight module with a very simple configuration, also for less experts. In just few simple steps, the free contact Joomla form is ready to work and allows you to receive contacts from your website. Choose which column to display each field in the contact form. Select colors for successful or error messages. Edit the default message sent by email and add your own custom fields or other useful tags such as the contact source page or website name. Add custom fields to your contact form. You can easily manage your custom fields by adding them in CSV format. A expressly created special window next to the text area, can help you to format the content correctly in CSV format, suggesting which data you have to enter. To install Digi Contact, go to under Joomla! extensions manager, choose to upload a package file and select Digi Contact package file (mod_digi_contact.zip). How hard is to configure this module? It's so easy, just install it, publish it in a module position, enter your email address where you want to receive emails. Can this module works with AJAX? No, actually this module doesn't use AJAX, so the page should be refreshed when the email is sent.